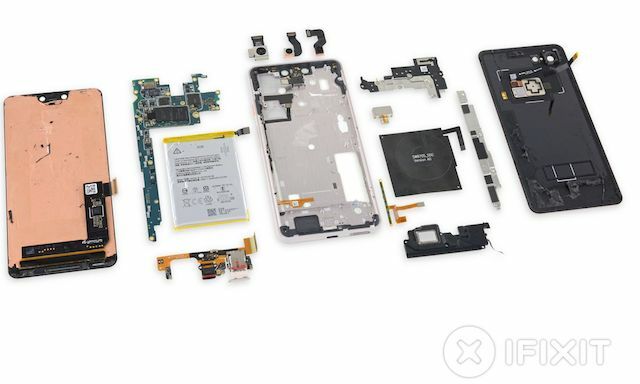 The teardown experts over at iFixit have ripped open the Google Pixel 3 XL revealing a bunch of new additions to Google’s latest flagship smartphone. In addition to discovering the new Google Titan M Security chip, the experts also found the all-new Samsung AMOLED panel which explains the brighter, more saturated display as compared to last year’s Pixel 2. After examining the Pixel 3’s construction which included massive amounts of glue for the rear glass panel, iFixit gave Google’s new flagship a poor repairability score of 4 out of 10. In fact, iFixit actually broke a few components, including a ribbon cable underneath the battery and a speaker, while removing some shielding. Overall layout and internals of the Pixel 3 XL look mostly the same as the Pixel 2 XL last year. iFixit found the same Google SR3HX “Pixel Visual Core” chip as last year. And as much as the Pixel camera impresses, the teardown experts confirm that Google is using the same hardware as everyone else i.e. a Sony camera sensor, which in this case is the IMX363. Check out the video version of the teardown below and share your thoughts with us in the comments section. TidBITS Marks Its 29th Anniversary… and Earth Day!